On the evening before her long awaited album launch gig, Danni Nicholls warmed up for the big event by returning to the West Midlands to play another show in support of the new record. MOCKINGBIRD LANE was first shared with audiences back in the spring with a short UK tour prompting an initial batch of positive reviews. Renewed interest and further media love has continued during the autumn batch of dates, leading to the eventual wide scale availability of a record deserved of a more expansive platform. A majority of the tracks were featured during the pair of sets which formed this show and once again explicit evidence was apparent as to why Danni is considered a prime singer-songwriter in trusted circles. 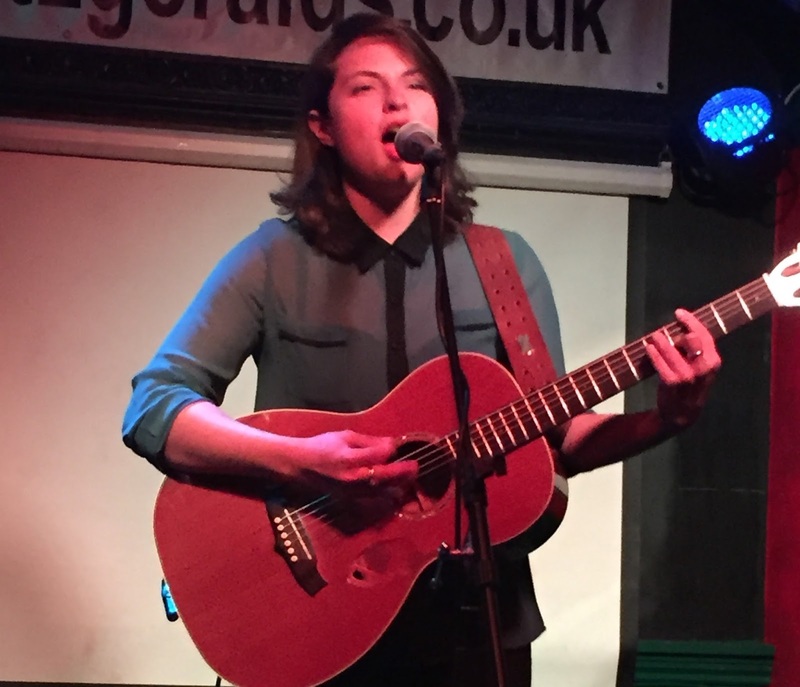 Katie Fitzgerald’s is a long established Stourbridge music venue and has been the home for the town’s folk club for the last couple of years, leading to a constant stream of high quality artists performing in the cellar bar. There has been less common visitors steeped in the country and Americana tradition, but a memorable evening in the company of Eve Selis can be recalled a few years ago. A less enjoyable gig was attended a while back when a non-ticketed weekend show by the Toy Hearts was spoilt by your usual noisy pub crowd treating the music as a mere irrelevance. At the start of Danni’s second set this evening, a number of folks did wander down to the cellar bar with an intention to carry on their Friday night social. However with an increased sense of confidence and purpose, Danni admirably used the power of the mic to remind them that this was a ticketed event, with the desired effect of creating the perfect listening environment for the rest of her performance. This was a significant victory for live music and well done Danni. Back to the music and a development since Danni played at the Kitchen Garden Café in April was the addition of Max Milligan on guitar to add an extra sound dimension to the songs. Maybe bringing some form of a rhythm section can be the next stage when she returns to the area for a future show. The core duo of extremely impressive melody driven songs and a voice burying deep into the spirit of each composition are firmly in place, to herald Danni as one of the UK’s brightest practitioners of communicating the magic of American roots music through a personal perspective. Around twenty songs were presented in full glory during the show and these can quite easily fit into three categories with the occasional overlap. Danni chose to celebrate the works of others in five songs with the most notable being a version of Will Kimbrough’s ‘Goodnight, Moon’ which closed her 2013 album A LITTLE REDEMPTION. A Randy Newman song, given a blues twist by Bonnie Raitt, ‘Guilty’ gave Danni the opportunity to stretch her vocal acumen in the first encore number. The evening ended with the usual dose of Johnny Cash and the endlessly covered ‘Folsom Prison Blues’, with the equally as popular ‘Jolene’ and Dylan’s ‘It Ain’t Me’, finding their way into the set list. However Danni Nicholls the recording artist is all about the stylish way she composes songs and presents them with the feel of becoming an accomplished standard. The new record is packed full of such numbers with three particular standing out during the evening. ‘Leaving Tennessee’, ‘Back to Memphis’ and ‘Travelin’ Man’ all have Americana connotations without being dressed in pseudo clothing. As some of you may be aware, Danni has recorded both her albums in Nashville with all the infra-structural help reaping rewards and this panache filters through from record to stage show. Two other experiences of the new record worthy of a mention are ‘Long Way Home’ selected to open the evening and ‘Look Up at the Moon’, where a glass of whisky replaces the guitar as the comfort blanket, thus freeing her vocals to move up a notch. 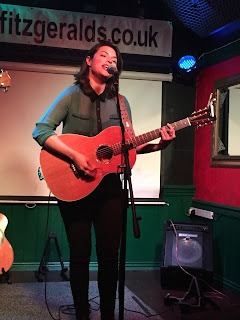 The third strand to the set list was a number of tracks lifted from Danni’s debut solo release headed by the title song ‘A Little Redemption’. Alongside a majority of the tracks performed this evening, the informative introduction added extra value with the Women’s Institute link to this song being a staple of Danni’s shows. There has been a recently detected link between Danni and the musicians associated with this venue as the song appeared on the compilation album BORN BRED BELIEVES in the company of a number of protest pieces performed by West Midlands artists. Her debut album was also represented on the evening by ‘Beautiful Game’, ‘Bird of Paradise’ and ‘Hey There, Sunshine’, with Danni gleefully recalling the pedal steel input from the acclaimed American player Al Perkins on the latter’s recorded version. So Danni ended the warm up show for her massive evening on a noted high and thoroughly confirming to those present that we have in our midst a creative talent adept in indulging in a musical direction which bonds many fans who attend her shows. Visualising her voice, songs and presence on a much bigger stage is not a difficult imaginary thought and maybe justice will prevail one day. In the meantime, giving Danni Nicholls a small amount of exposure through three reviews this year has hopefully played a small part. There aren’t many artists of her ilk passing through Stourbridge and this performance was both cherished immensely and now chronicled in the infinite vaults of the blogosphere.